Alma 13 concludes the words of Alma to the apostate Nephites of the city of Ammonihah. Alma’s discourse mainly focused on repentance, a subject which he had been commanded by the Lord, through the voice of an angel, to preach to the people of that city (Alma 8:16). However, in chapter 13 Alma began to speak about the priesthood and about Melchizedek. Alma’s words are among the most spiritually moving in all of scripture concerning this important high priest who brought forth bread and wine and blessed the patriarch Abraham, from whom he received tithes (Genesis 14:18–20). Alma brilliantly used Melchizedek as his primary model of righteous priestly influence. Although this information about Melchizedek may seem out of place to modern readers, it masterfully drives Alma’s message home to his audience. As Alma and Amulek preached their message of repentance, they used language and symbols that they knew the people of Ammonihah would recognize. Although these people had come to reject the traditional Nephite belief in a Messiah and also the notion of repentance for sins (see, e.g., Alma 1:4; 15:15), they would still have likely known the material concerning Melchizedek from the records on the plates of brass Nephi brought from Jerusalem. Also they would have likely recognized the forms and symbols of Nephite temple rituals. It appears that the primal history and related temple rites served as a strong source for the material that Alma and Amulek presented, as explained in a previous KnoWhy. 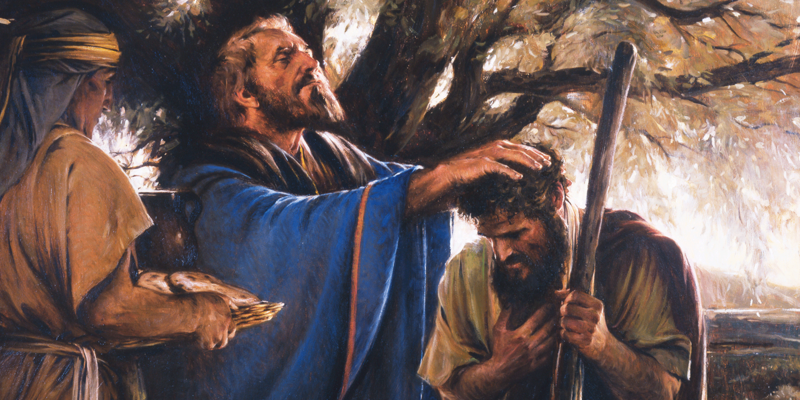 As Alma turned to the second half of his exposition, he spoke specifically about what was likely a main feature of the Nephite temple ritual, namely the high priesthood of the order of the Son of God, of which Melchizedek was a most notable example. The presentation of the royal “Son of God” as the priest “after the order of Melchizedek” was known in the ancient rituals of the Israelite temple in Jerusalem, and Jesus Himself would refer often to Psalm 110 which contains the attestation, “Thou art a priest for ever after the order of Melchizedek” (Psalms 110:4). Alma’s point-by-point argument in Alma 12–13 is evidence that this high regard for Melchizedek was perpetuated in the Nephite tradition as well. Alma’s use of Melchizedek assumed his audience was somewhat familiar with this material already. Most of all, Alma emphasized how Melchizedek used his position as high priest to help his people to humble themselves and to repent of their wickedness (Alma 13:13, 17–18). Perhaps bringing about the greatest priesthood miracle of all, Melchizedek preached repentance to his people, “and behold, they did repent” (v. 18). He pointed his people toward the Son of God through priesthood ordinances (v. 16) and brought peace to the land (v. 18). He was a shining example of a high priest after the order of the Son of God (v. 9), one of the greatest that ever lived, and for this reason he was particularly mentioned in the Hebrew scriptures (v. 19). The deepest wish of Alma’s heart was that somehow he could do likewise and cry repentance in such a way that his people “should repent and come unto our God, that there might not be more sorrow upon all the face of the earth” (Alma 29:2). that he might preach the word of God unto them, to stir them up in remembrance of their duty, and that he might pull down, by the word of God, all the pride and craftiness and all the contentions which were among his people, seeing no way that he might reclaim them save it were in bearing down in pure testimony against them (Alma 4:19). Considerable amounts of pride had arisen in the church, and also apostasy due to the priestcrafts that Nehor had helped spread. Alma successfully shared his priestly message with the people in Zarahemla, Gideon, and Melek with promising results. In the context of his preaching in Melek, before heading to the city of Ammonihah, Alma 8:4 brought up the issue of authority, stating that Alma taught “according to the holy order of God, by which he had been called.” This declaration leads into the record of his efforts among the people of Ammonihah, upon whom “Satan had gotten great hold” (Alma 8:9). The people of Ammonihah, however, had embraced the religion of Nehor (see Alma 16:11), and thus they had utterly rejected Alma’s authority as high priest when he tried to preach in their city (Alma 8:11–12). The Nehorite priests preached “for the sake of riches and honor” and despised the church of God (Alma 1:3, 16). They saw Alma as a threat, because the members—and leaders—of the church of God “were not proud in their own eyes, and because they did impart the word of God, one with another, without money and without price” (Alma 1:20). Alma was cast out of Ammonihah, but the Lord commanded him to return, this time with Amulek as a second witness, and to prophesy unto them that the Lord would destroy them because of their iniquities. Alma and Amulek were given power and authority from God to call the Ammonihahites to repentance (Alma 8:29–32). In this context, Alma’s account of the story of Melchizedek served to legitimatize his claims of authority from God by appealing to this ancient order of the holy priesthood. Similar to Alma, Melchizedek had been both a great political as well as religious leader. Melchizedek’s story was one that people of Ammonihah probably knew and possibly still respected as canonical. If they respected the legacy of Melchizedek, they should have appreciated what he had done for his people. Alma made sure to emphasize the point that Melchizedek’s people, too, had “waxed strong in iniquity and abomination … had all gone astray” and “were full of all manner of wickedness” before Melchizedek had led them to repent (Alma 13:17). Those of the profession of Nehor did not believe in the repentance of their sins (Alma 15:15), but they evidently did not have so low an opinion of scripture yet that they could ignore Melchizedek, so Alma drew a deliberate contrast between what their leaders were leading them to do (not repent and harden their hearts) with what a truly righteous leader such as Melchizedek would be doing. He argued that they should repent contrary to the Nehorite antipathy towards doing so. Finally, Alma made extensive efforts to emphasize that the power by which this was accomplished was not Melchizedek’s priesthood, but that it was God’s “holy order, which was after the order of his Son.” If they truly wanted to approach God and obtain His salvation, the people of Ammonihah would ultimately need to accept the Messiah, the Son of God, and the priesthood ordinances that came through His holy order. Today, we likewise need the saving ordinances of the Melchizedek priesthood to gain salvation. By attending the temple and fulfilling our covenants to God, we can participate in ordinances of the Melchizedek priesthood “after the order of his Son” to bring us closer to God. John W. Welch, “The Melchizedek Material in Alma 13:13–19,” in By Study and Also by Faith, 2 vols., edited by John M. Lundquist and Stephen D. Ricks (Salt Lake City and Provo, Utah: Deseret Book and FARMS, 1990), 2:238–272. Other accounts of Melchizedek in ancient scripture can be found in Genesis 14:17–24 (see also, notably, JST Genesis 14:17–40); Psalm 110:4 (Alma seems to be familiar with both the Genesis and Psalms passages); and Hebrews 7. For comparisons between Alma’s depiction and other ancient sources, see John W. Welch, “The Melchizedek Material in Alma 13:13–19,” in By Study and Also by Faith, 2 vols. ed. John M. Lundquist and Stephen D. Ricks (Salt Lake City and Provo, UT: Deseret Book and FARMS, 1990), 2:238–272. Book of Mormon Central, “What Did Alma Teach about the Temple? (Alma 12:30),” KnoWhy 119 (June 10, 2016). Further evidence of temple themes can be seen in Alma’s use of the temple pilgrimage song, Psalm 95. Alma 12:35–37 borrows from Psalm 95:8, 11 and Alma 13:6 uses a phrase from Psalm 95:11. Compare with Jacob’s similar usage in a temple context; Jacob 1:7 (Psalm 95:8, 11); 6:6 (Psalm 95:7–8); see Book of Mormon Central, “Why Does Jacob Quote So Much from the Psalms? (Jacob 1:7),” KnoWhy 62 (March 25, 2016). See, e.g., Psalms 2:2, 6–7, 12; 89:27; 110:1–4; these psalms almost certainly described parts of temple rituals involving the Israelite monarch. See Margaret Barker, Temple Theology: An Introduction (London: SPCK, 2004), 4–5, 24. The book of Mosiah gave considerable attention to the issue of priesthood authority, as was discussed in Book of Mormon Central, “Why Does the Book of Mosiah Talk So Much about Priesthood Authority? (Mosiah 23:17),” KnoWhy 101 (May 17, 2016). The record repeatedly stated that both Alma the Elder, as well as his son Alma after him, acted with “authority from God” (See, e.g., Mosiah 13:6; 18:13, 17, 18, 26; 21:33; 23:16–17; 26:7–8; 29:42). Due to the recent experiences that the Nephites had with the unrighteous use of authority, the book of Mosiah emphasized the need for men to repent and commit themselves to the service of the Lord in righteousness in order to exercise the power and authority of the priesthood. For more on Nehor and his preaching, see Book of Mormon Central, “Why Did Nehor Suffer an ‘Ignominious’ Death? (Alma 1:15),” KnoWhy 108 (May 26, 2016). I think it difficult to prove that these descendants of Lehi; "strangers with them out of Ephraim and Manasseh" 2 Chronicles 15:9, who effectively stole the scriptures from the temple treasury of Laban were actually exercising the priesthood of Melchizedek.